A tie-in to the video game Battlefront II, this book tells a story of elite Imperial soldiers on a mission to track down the remnants of Saw Gerrera's rebel extremists after the events of Rogue One and the destruction of the Death Star. This is the second book based on the Battlefront video games. 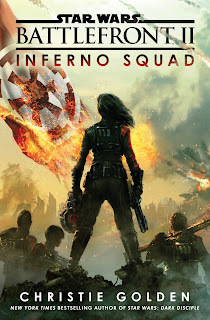 The first was Battlefront: Twilight Company by Alexander Freed, though that book actually takes place after Inferno Squad in the timeline.